A nightstand doubled as a drug desk for heroin addicts along the gulch on Gurney Street. 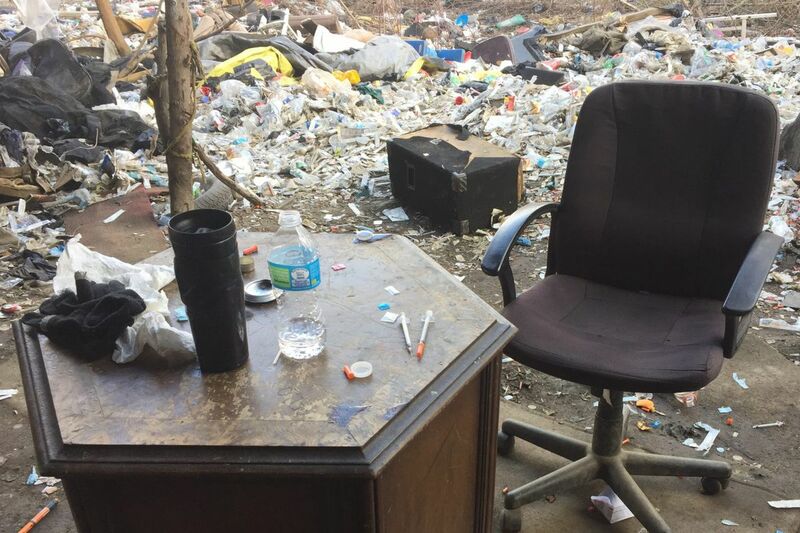 Philadelphia is to be commended for finally starting to clean up the filthy, secluded heroin encampment near a stretch of train tracks in Kensington, but the toughest work lies ahead. The city is trying to figure out how to heal the addicts and serve the residents of a neighborhood stuck in a heroin habitat that became the epicenter of Philadelphia's drug crisis. Addicts were drawn to a sunken section of the Conrail tracks near Gurney Street to get high and crash. Seventeen people died there last year. The surrounding community's residents have endured an invasion of dealers selling drugs and addicts stealing whatever they can find to buy drugs. For about a year, police and social service agencies worked together to come up with a plan to deal with this oozing sore. After months of frustrating negotiations with Conrail, the city secured an agreement to join hands to clean up the tracks and keep them clean. The cleanup started with workers clearing overgrown vegetation. Construction equipment was brought in to remove piles of trash, including hundreds of used needles. The city also brought in trailers with outreach workers who could connect addicts with treatment programs. For the community, the city has promised to clean and seal the 30 abandoned houses near the tracks so addicts can't return. If the city is unable to turn over the abandoned houses to new residents, it is open to demolishing them. The city has stepped up police protection and trash cleanup. It is poring over information to determine what a safe block ought to be, and recruiting residents to become block captains who keep an eye on the streets. To disrupt supply and demand, the city plans to take a two-prong approach: aggressively targeting drug dealers and working with doctors to stop the overprescribing of opioids, which leads to addiction. Philadelphia is just one city battling an epidemic that has knocked the nation on its heels. The latest government data showed 33,000 opioid overdose deaths across the country in 2015. Treatment, loss of productivity, incarceration, and other legal expenses cost over $100 million a year, reports the federal Centers for Disease Control and Prevention. Philadelphia lost 907 people to fatal overdoses last year. Meanwhile, the Gurney Street area cleanup and services to the addicts and neighborhood could cost as much as $15 million. City Managing Director Michael DiBerardinis says he knows all the work could be for naught without a good strategy, but that good strategy is elusive. Other cities offer a few good ideas. Baltimore dispatches vans with health-care workers to heroin hot spots to give addicts clean needles and naloxone, the overdose antidote. In Manchester, N.H., addicts can go to nearby fire houses to get referrals for medical treatment or therapy. Philadelphia's ambitious holistic approach, pulling together social workers, health experts, and police to reinforce a neighborhood and treat addicts, is a less traveled course. "I don't know if it's going to work," DiBerardinis said. "My instincts tell me it has a shot." Here's hoping he's right. Philadelphia, the birthplace of good ideas, seems determined to come up with a few more. It doesn't have a choice.